Just over five months since an initial debut in select regions, Facebook Messenger's suite of built-in games is going global. In addition to rolling out worldwide, Facebook Messenger's Instant Games are also getting beefed-up features and more specialized "Game bots" that allow developers to make the most of games designed for the originally chat-focused app. Using these new features, Messenger's games can now incorporate leaderboards and tournaments to help cement bragging rights, as well as allow for turn-based games for those times you can only dip in periodically throughout the day. 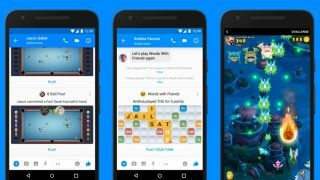 The first new game to take advantage of these features is Zynga's Words With Friends, letting Facebook Messenger's one billion-plus user base play the extremely popular, albeit eight-years old, Scrabble-style game without leaving the app. Also being added is Miniclip's 8 Ball Pool, which is expected to come to mobile devices "very soon" for those looking to do a little billiards with family or friends during their lunch break or commute. The boosted version of Instant Games on Facebook Messenger rolls out today for both iOS and Android, and is expected to complete its expansion within "the next few weeks."